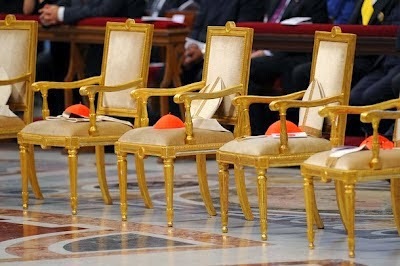 As expected, at this Sunday's noontime Angelus, the Pope revealed the names of 20 cardinals-designate – 15 electors, five over 80 – who'll receive the red hat at the 14 February Consistory. Yet again, Francis' second biglietto (ticket) into his Senate represents a shock to the system – again, no Americans (a second consecutive shut-out unseen in almost four decades), while for the first time, membership in the papal electorate goes to prelates from Myanmar, Cape Verde, Panama and Tonga, as well as returning to long-unvisited outposts in New Zealand, Thailand, Ethiopia and Uruguay. All in all, the ongoing shake-up of the College reiterates Francis' desire to bring the church's "peripheries" to its center in the forum which will determine the church's direction after his pontificate ends – and, of course, the talent pool from which a new Pope has invariably been drawn for the last eight centuries. Beyond the red hat's first-time country destinations, three of the global church's most powerful hierarchies were rocked by the choices from their ranks as Papa Bergoglio again bypassed Italy's traditional cardinalatial sees with his two residential picks in the country (the archbishops of Ancona and Agrigento), doing the same for Spain with the elevation of the archbishop of Valladolid (the president of its episcopal conference) and in Mexico by sending the red to Morelia in Michoacan – an area marked by drug violence far from the historic scarlet seats of Mexico City, Guadalajara and Monterrey. On another front, as he did in his first slate last year with Haiti's first-ever cardinal, Chibly Langlois of Les Cayes, Francis likewise elevated three diocesan bishops not of metropolitan rank. In an explanatory note released after the announcement, the VatiSpox Fr Federico Lombardi stated the obvious, relaying that "universality" was the Pope's watchword for his picks, and that Francis by no means feels "bound to the tradition of 'cardinalatial sees.'" Keeping the practice begun last time, the designates were again not given advance notice of their elevation – a choice that, given the routing of the heads-up through the Nunciatures, ensures no leaks of the list. Beyond the new intake, as even existing cardinals were left guessing over the shape of the incoming class over recent days, one op nailed it best in the run-up to the announcement in saying that a redistribution of red hats to create "a more representative College" represents "the reform that will cement [Francis'] legacy." And even more powerfully this time around, he's gone about doing just that. Archbishop Dominique Mamberti, 62, Prefect of the Apostolic Signatura. As initially reported here in October – and reiterated by Francis this morning – the entire College will be convened for two days of pre-Consistory discussions on February 12th and 13th. The session with the roughly 200-member "senate" will be the Pope's first wider consultation on his impending reform of the Roman Curia. With the new crop, the College will number 125 electors after the February intake. It is expected that Francis has now established a pattern which will see annual Consistories on or around the feast of the Chair of Peter (February 22nd); this year, the date is slightly earlier as Ash Wednesday falls on the 18th. Reminding the massive crowd beneath the window of the old Papal Apartment that the College – the historic successors of the parish pastors of Rome – represents "the unbreakable link between the church of Rome and the dioceses of the world," Francis asked his listeners to pray for the incoming cardinals "that they might renew their love for Christ, be witnesses of his Gospel in the city of Rome and across the world, and that their pastoral experience might more intensely sustain me in my apostolic service." 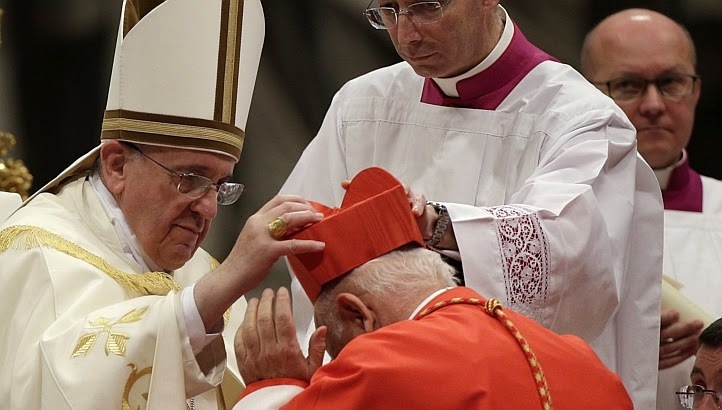 Lest anybody forgot, on announcing his first scarlet batch a year ago this week, the Pope issued a public letter to the cardinals-designate warning them that they were to accept the red hat as "neither an honour nor a decoration," but "simply a service that requires you to broaden your gaze and open your hearts." The incoming class was likewise urged to greet their elevations in a manner "far from any expression of worldliness or from any form of celebration contrary to the evangelical spirit of austerity, sobriety and poverty." 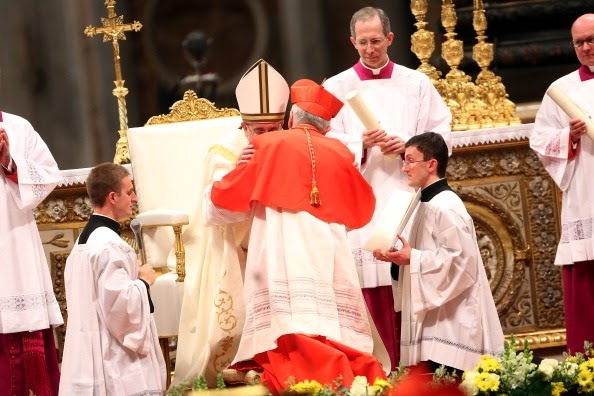 "The cardinalate," Francis said, "does not imply promotion."